Post-apartheid urban and housing policies have underscored the necessity of progressively integrating the poor as a means of restructuring spatially fragmented cities and eradicating asset-based poverty. 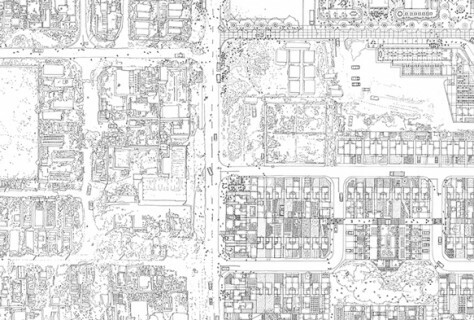 Post–apartheid urban policies had to redress apartheid fragmentation and segregation and the subject of transformation in democratic South Africa has been the historically constructed uneven development of ‘islands of spatial affluence’ in a ‘sea of geographic misery’. With the relaxing of influx controls during the late 1980s, South African cities have been subject to rapid urbanization and resultant growth of informal settlements in inner-city and peripheral areas. The growth of informal settlements in the past two decades have by far exceeded government’s efforts to deliver better services, provide adequate housing and mitigate against disasters and vulnerability. Despite the government’s efforts to deliver more than 2.5 million housing units since 1994, the housing backlog have remained at 15-17% of the urban population (2.1 million units outstanding). Today there are more than 2,600 informal settlements, and continue to grow between 5-7% across different regions. This is a stark increase from 300 informal settlements in 1994. Urban vulnerability has increased, juxtaposed with worsening human development indices, service delivery constraints, insecure tenure, and safety and security concerns. Since 2004, with the introduction of Breaking New Ground, and through consecutive National Housing Codes (2004, 2007, 2009), the Department of Human Settlements have introduced the concept of “upgrading informal settlements”, which aims to progressively integrate informal settlement into the broader urban fabric, deliver better services, and incrementally secure tenure. To this effect, a performance agreement was signed between the Presidency and National Minister of Human Settlements, Mr. Tokyo Sexwale. Output 1 of the Presidency’s Outcome 8 (Sustainable Human Settlements and improved quality of household life) aims to upgrade 400,000 households in-situ by 2014. Moreover, such interventions are also spotlighted by Chapter 8 of the National Development Plan (also called “Vision 2030”) which calls for the integration of informal settlement into the urban fabric through upgrading, incremental security of tenure, and better service delivery. Community organisations of the poor have been systematically sidelined through the governments supply-sided approach to urban restructuring and housing delivery. The rally call of social movements in South Africa has been that of greater inclusion in decision making processes and meaningful engagement around settlement improvement. 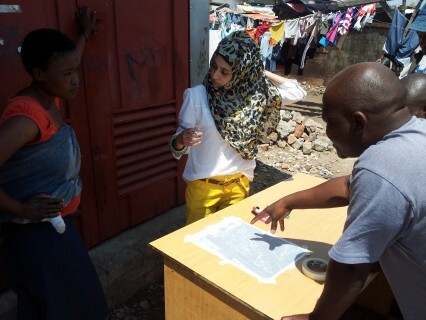 The Informal Settlement Network (ISN) has emerged as an alternative social movement that prioritises pragmatic engagement with government around collaborative approaches to upgrading of informal settlements. 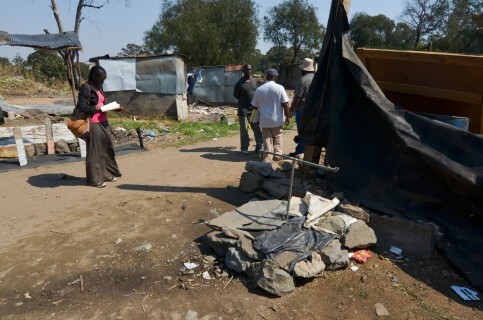 However, in Gauteng, communities have been systematically disregarded, which lead to the mobilization of thousands of informal settlement dwellers to march on the office of the premier. 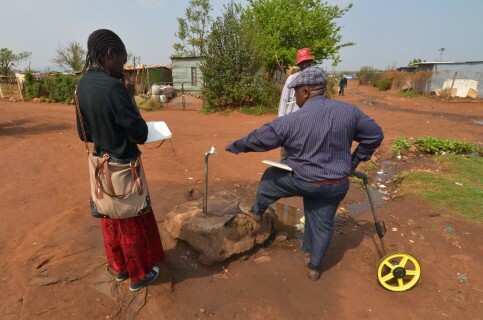 In the wake of the Asihambe solidarity march on the 11th September, and in response to the growing demand from communities to start small scale and autonomous improvement projects, the Johannesburg CORC office has begun a renewed effort through the CUFF project process of engaging and supporting the informal settlement communities in Gauteng around a range of projects. The Community Upgrading Finance Facility (CUFF) is an initiative of the South African Alliance. The fund is capitalized by CORC, uTshani Fund and contributions from SDI. The Fund’s board—made up of 60% shack dwellers and 40% support NGO professionals—receives proposals for upgrading projects, but the community is ultimately responsible for writing up the project description, get quotes from suppliers, and implement the project (with support from ISN, CORC and uTshani Fund). The CUFF projects are one of several tools CORC uses to support the ISN/FEDUP in mobilising organised communities towards development. 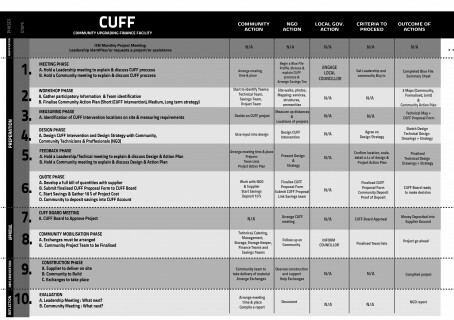 The CUFF projects work synergistically with the Savings, Enumeration, and Community based planning methodologies alongside partnership formalisation with local government, and call for the identification of a key developmental item needed by a community. The leadership and community members then work with ISN/FEDUP and CORC technical members to design, quantify and cost the project. In order to proceed, the community members are required to collect and save a fraction of the project cost towards the contribution of the overall costs that, once approved by the CUFF community/NGO board, will be implemented in the community. The objectives of the CUFF projects are to set precedents for Govenment and Community partnerships in informal settlement upgrading by providing technical assistance and seed capital for pilot projects. This process should ideally create systems, procedures and structures that enable communities to work in collaboration with government institutions. In order to meet these growing demands, the Johannesburg CORC office has employed the help of several new interns from the 1:1 Student League Network, having gained experience in this network through the University design/build projects, they are open minded and ready to engage with the difficulties involved in the socio-technical support of community driven development processes. These interns are working under the supervision and guidance of the ISN/FEDUP’s technical community groups and the various leadership structures in the settlements. We met with leadership at the community hall to initiate community mapping process where we mapped out key areas and “problem” areas, as described by the Magandaganda community. Members expressed a desire to have their own yards as they are experiencing disputes regarding unclear tenure. A few members of the leadership also showed some hostility and hesitation as they felt that their concerns are not being taken further fast enough. They also expressed concern regarding the risk of crossing the rail-line that borders the settlement. The CUFF teams are working on several projects in the City of Johannesburg and Ekurheleni such as Marathon, Delport, Peter Mokaba, Innesfree and Magandaganda. These projects vary from the installation of communal taps to the allocation of plots in denser settlements. The enumeration will provide the settlement committee with total knowledge of everybody who is the settlement. This will also assist the community in dealing with and control of allocation into sites once their measured into a layout … The community has promised to provide us with the background history of the settlement when the community meets with ISN and CORC technical teams. ISN delegates assist the community with the measurement and costing of the pipes in order to increase a number of taps in the settlement. The collaboration between community organisations and committees that drive local development agendas, networking at the regional level via ISN, and receive technical support from CORC and ISN is proving to be an indispensable model for community driven development. Simultaneously the CUFF project teams are profiling and collecting critical data to prepare identified settlements for larger development processes through the National Upgrading Support Programme (NUSP). http://www.info.gov.za/issues/outcomes/index.html. Other outputs of Outcome 8 is to improve the access to basic services (Output 2 includes the following improvements: Water – from 92% to 100%; Sanitation – from 69% to 100%; Refuse removal – from 64% to 75%; Electricity – from 81% to 92%), facilitate the provision of 600,000 accommodation units in the gap market (earning between R3,500 and R12,800), and mobilisation of well located public land for low income and affordable housing. halala isn / fedurp and corc, organise, mobilize and build sustainable and independent communities.